Melt butter in large saucepan. Saute ham 5 minutes and set aside. Saute onion, celery and green pepper until onion is transparent. Add chicken broth, potatoes, and pepper. Cover and cook over moderate heat about 20 minutes, or until potatoes are just tender. 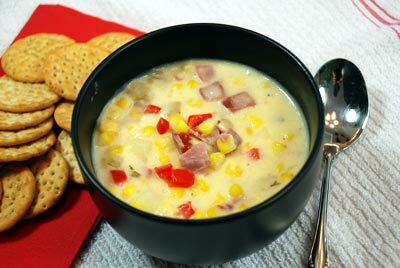 Add milk, cream, corn, reserved ham and pimientos. Reduce heat and cook until thoroughly heated. Do not boil. Spoon into bowls and garnish each serving with paprika.